My great-grandmother, a shyly smiling little woman in a black babushka summer or winter, was Both Bórbala (in English Barbara Both). 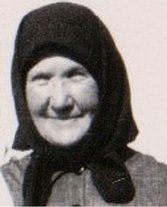 She was born in Csíkkarcfalva, Erdély, Hungary in 1883. In 1921, after Trianon, it became part of Romania and was renamed Cârţa.